Christmas has come just a little bit early, today, here at Lilac Anime Reviews. It’s messengers? A middle aged homeless man, a homeless former Drag Queen, a teenage runaway, and a baby. You’re welcome. 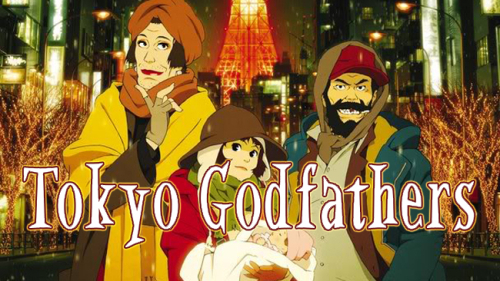 Tokyo Godfathers is a 92 minutes film from directors Satoshi Kon and Shogo Furuya and animated by Madhouse. The screenplay was written by Kon and Keiko Nobumoto and the film premiered in Japan on, my 13th birthday, November 8, 2003. The film is licensed by Sony Pictures. On a Christmas Eve, three Tokyo homeless -- mid-aged alcoholic man Gin, high school runaway girl Miyuki, and former drag queen Hana -- were searching dumpsters and trash bags for possible Christmas gifts for themselves, when cries from a baby drew their attention. Believing this was a gift from God, Hana, who couldn't have a baby of "her" own, vowed to take care of the abandoned baby girl and together they began searching for the baby's mother. 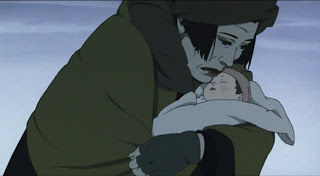 I mentioned in last week’s review of Millennium Actress that the art style and animation were stunning. Tokyo Godfathers’s is stunning too, but in it’s own way. 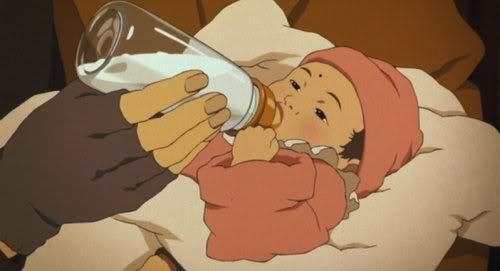 Where Millennium Actress had different time periods to play with, visually, Tokyo Godfathers had real life Tokyo. What makes this work is the use of light, shading, use of actual Toyko landmarks, and very big attention to detail. This paid off for Godfathers as well as the character designs and the music. The music is a mix of electronica Classical and Christmas tunes, including Beethoven's 9th Symphony, and some other fun upbeat sort of creations. This helped add to the comedy brought on by the story and the witty dialogue. Perfect segway right? The story, again, being directed and written by Kon means it’s pretty much genius. However, there is something different about this one. All of his movies up until this point had some twist of reality to it and had more pieces of psychological moments. With Tokyo Godfathers, there isn’t a single drop of this, and you would think, “This is a Kon film? Why isn’t my mind destroyed?” Kon also had an affinity for Japanese society and would sometimes use this as satire. You may have picked up on a few things here and there from Perfect Blue and Millennium Actress. If anything, Tokyo Godfathers is a major testament to Kon’s use of satire. 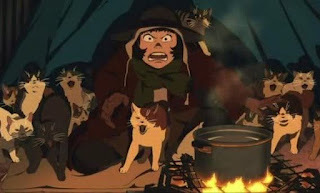 Along with his sharp wit with dialogue, Tokyo Godfathers is one of the most hilarious and, even, heartwarming films I’ve seen in a long time. 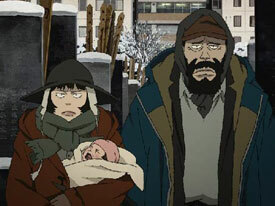 In an interview with Kon, he stated that he didn’t quite have an inspiration for the characters of Tokyo Godfathers. So what he ended up doing was taking character traits from people he knew and kind of threw them together to see what would work. I guess we can say he done good. Not only did the personalities work well, but the the pasts of each of our “heros” is explored throughout the film; and all are linked together by one thing. The baby. I guess what Hana said was right, the baby is a messenger of God. Any who, the characters couldn’t be any more perfect! From personality, to backstory, and with Kon’s wit, they are an amazing combination of bumbling idiots on a cold winter’s night. I’d even say the movie is worth watching for the characters, alone. Bet I know what she wants to be when she grows up. Now, according to Anime News Network, this film has a dub. However, like Millennium Actress, my copy doesn’t have the dub on it. So guess what? IT’S JAPANESE AUDIO! ALL DAY LONG! And I have no complaints. With a pretty top notch cast, including Aya Okamoto, in her first animated film role, Toru Emori, and Yoshiaki Umegaki you can’t go wrong here. Okamoto brings in the snark and naivety to Miyuki, while Emori and Umegaki play off each other like a married couple as Gin and Hana, respectively. If there was a dub, I just hope it lives up to this film or I will be a very unhappy camper. 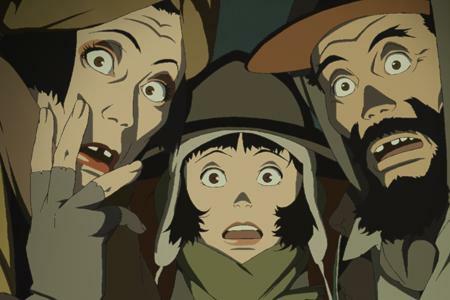 By Christmas morning, Tokyo Godfathers is a different side of the late Satoshi Kon, and is certainly a testament to his satire on Japanese society. The visuals are great, the characters are witty and energetic, and the story is even MORE heart warming then Millennium Actress, that I kinda wanted to cry. This film DESERVES you undying attention, because who doesn’t want to get that warm fuzzy feeling on Christmas? Only one more film to go! And we all know what’s coming next! People on shrooms. Until next time, otaku on my friends. Over at Free Bitcoin you may claim free bitcoins. Up to 22 satoshis every 5 minutes. If you are searching for the most recommended Bitcoin exchange company, then you should choose YoBit. Ever consider maximizing your free BTC collections by utilizing a BITCOIN FAUCET ROTATOR?